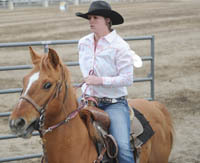 There’s one rodeo remaining on the 5th District High School circuit for the spring of 2013 after last weekend’s stop at Blaine County Fairgrounds in Carey for two performances. Still in the all-around leads among the 59 circuit cowgirls and cowboys after five rodeos are Kortney McReynolds and Brogan Bennett, both riding for Gooding. The district finals are May 24-25 in Shoshone. From the district the top six qualifiers in each event based on the season standings advance to the Idaho State High School Rodeo Finals June 10-15 at Bannock County Fairgrounds in Pocatello. McReynolds, a Caldwell High School senior, is riding for Gooding this spring because rehabilitation from a knee injury precluded her from competing last fall in high school rodeo in her district area. She has 280 points to lead Gooding’s Cassie Bahe, who has 234. At Carey, McReynolds won Friday’s barrel racing (17.440 seconds) and goat tying (8.390), then she added a goat tying win Saturday afternoon (8.070). She leads the goat tying standings with 81 points over Savannah Fleming of Gooding, with 80. For the Carey weekend McReynolds added 59 points to her season total and Cassie Bahe also enjoyed a good weekend with 56 points including an 19-point haul in breakaway roping. Cassie Bahe leads the breakaway standings by a large margin with 82 points. Brogan Bennett posted two steer wrestling wins at Carey in 5.850 and 5.000 seconds, extending his lead in steer wresting to 79-54 over Caleb Bradshaw of Gooding. Bennett also earned third- and fourth-place team roping points with partner Wyatt Williams of Gooding. With his 42 points at Carey Bennett stretched his all-around lead to 198-152 over teammate Williams. Carey also saw the first saddle bronc qualifying ride this season, Valley’s Cody Ruby chalking up a 63-point ride Saturday. Fairfield’s Whitnee Hurless placed third in Saturday’s barrel racing (17.924) at Carey and now stands in fourth place in the barrel racing standings with 60 points. Valley’s Marlee Mussman leads with 86, Jerome’s Cheyenne Logan has 74 points and McReynolds 73. Carey’s Kylie Castle collected 13 points in her home arena topped by a fourth place in Saturday’s goat tying (10.010 seconds). Wood River’s Tayler Bosch picked up a couple of points with a ninth place in goats (12.030) on Saturday. · All-around girls: 1—Kortney McReynolds, Gooding 280 points. 2—Cassie Bahe, Gooding 234. 3—Savannah Fleming, Gooding 166. 4—Bailey Gough, Gooding 164. 5—Cheyenne Logan, Jerome 152. 6—Max McCammon, Gooding 143.5. 7—Emelia Millican, Gooding 134. 8—Anna Bahe, Gooding 119. 9—Marlee Mussmann, Valley 109. 10—Whitnee Hurless, Fairfield 99. 12—Kylie Castle, Carey 82. 24—Tayler Bosch, Wood River 14. 26—Larissa Roberts, Wood River 9. · All-around boys: 1—Brogan Bennett, Gooding 198 points. 2—Wyatt Williams, Gooding 152. 3—Cody Ruby, Valley 137. 4—Cole Lickley, Valley 121. 5—Pake-Os Palmer, Richfield 93 and Caleb Bradshaw, Gooding 93. 7—Jake Faulkner, Gooding 83. 8—Ty Faulkner, Gooding 79. 9—Johnny Pavkov, Gooding 68 and Justin Connell, Richfield 68. 12—Matt Whitworth, Carey 53. · Barrel racing: 1—Marlee Mussmann 86. 2—Cheyenne Logan 74. 3—Kortney McReynolds 73. 4—Whitnee Hurless 60. · Breakaway roping: 1—Cassie Bahe 82. 2—Kortney McReynolds 58. 3—Emelia Millican 56. 4—Anna Bahe 43. 10—Whitnee Hurless 23. 11—Kylie Castle 17. · Calf roping: 1—Wyatt Williams 74. 2—Cole Lickley 71. 3—Pake-Os Palmer 43. 4—Brogan Bennett 41. 5—Matt Whitworth 39. · Goat tying: 1—Kortney McReynolds 81. 2—Savannah Fleming 80. 3—Cassie Bahe 68. 4—Max McCammon 59. 7—Kylie Castle 39. 10—Tayler Bosch 13. · Pole bending: 1—Bailey Gough 96. 2—Kortney McReynolds 63. 3—Morgan McCarthy, Jerome 48. 4—Kendra McConnell, Dietrich 36. · Steer wrestling: 1—Brogan Bennett 79. 2—Caleb Bradshaw 54. 3—Tanner Hall, Valley 36. 4—Jake Faulkner 33. · Team roping: 1—Brogan Bennett and Wyatt Williams 78. 2—Cole Lickley and Pake-Os Palmer 50. 3—Justin Connell and Ty Faulkner 42.